The current homepage of rosetta sites still uses the old design which is kind of confusing if you switch from wordpress.org to a locale specific site because the language banner told you so. We should bring the new layout to the locale site and extend it with some local community things like upcoming events and we'd want to highlight the latest news, something the current homepage is lacking too. 2861-upcoming-events.png​ (210.7 KB) - added by ocean90 22 months ago. 2861-map.png​ (669.4 KB) - added by ocean90 22 months ago. 2861-headings.png​ (66.7 KB) - added by SergeyBiryukov 18 months ago. 2861-powerful-features.png​ (48.0 KB) - added by SergeyBiryukov 18 months ago. 2861-alignment.png​ (75.0 KB) - added by SergeyBiryukov 17 months ago. 2861.diff​ (428 bytes) - added by DeFries 17 months ago. and we'd want to highlight the latest news, something the current homepage is lacking too. Is there anything that can be done to help in this task? Maybe we just have to start with the new layout and then extending it with the new functionalities? WPorg: Add line-hight setting for XL buttons. Main: Include parent theme css changes in watch. Main: Add front page template. Brings the existing WordPress.org front page to the Main theme. Still nneds work around pulling in News posts and some polish. WPorg: Add basic 404 page. Borrows most of it from the Plugin Directory. Uses the site title band for page titles. Main: Use parent index file. Moves Get page into its page template. Contains floated Rosetta menu items. Main: Register Rosetta heeder menu. WPorg/Main: Pull teaser post from blog. wrong color and the divider to home below didn't show up. WPorg/Main: First pass at blog-related templates. Main: Add page template for releases. Also removes sidebar from page content. Main: Improve comments and entry meta styles. Also regroups some component styles to a more appropriate location. Main: Keep menu item highlight white for blog. Main: Bring entry meta closer to existing styles. Also adds the sidebar to single posts. Introduces styles for sticky posts, galleries, and posts navigation. Consistent margin between post meta and content. Includes a clever way to avoid having the posts navigation wrap on two lines. Allows for both parent and child theme strings to be translated in one GlotPress project. Makes sure we always get a rosetta menu, which is hooked into the get_header action. Also includes a brand new download button widget. Switched to using optimized images for front page. This was still missing from the original Rosetta theme, causing a fatal error on the releases page. Also moves this into a slug-based page template, so it doesn't require editing the page after switching themes. Fixes a bug where translated strings would not be shown, due to the missing text domain. It turns out that rtlcss takes care of flipping that direction for us. Main: Make some links localizable. Main: Determine URLs for main pages which we know exist on Rosetta sites, avoiding the need to translate the URLs. You can find the download button at ​https://en-au.wordpress.org/txt-download/. As for the showcase, yes, we'll need to figure that out. And soon. Thanks for bringing it up! Until we have a more permanent solution, maybe we could show them in the notable-users section? What about adding the button to the home page just as w.org does? How does that help if that page is no longer included in the home page content and isn't linked to from anywhere? The download button should be in the header, same as on the main site, not at the bottom. Another issue I see is that some headings are too narrow for translated strings. See 2861-headings.png​ — the first heading clashes with "News From Our Blog", the second one wraps to a new line. The new forums theme ​used the opt-in approach initially and was only activated for all locales after all reported issues were fixed. Why was a different approach taken here? In the Powerful Features grid, localized sites don't have the middle vertical line. See 2861-powerful-features.png​. Yeah, we could probably do that. It pretty much just takes the Download menu item and styles it like a button, so length of the menu shouldn't be too much of a concern initially. It's linked to from the "Get WordPress" button below the fold. Let me find out how much magic is involved with the w.org header download button and see if we can duplicate that. How would you suggest to fix it? Fixes a bug with media queries, where the middle divider for Powerful Features wouldn't be displayed on large screens. This will emulate w.org's behavior by turning any link to txt-download into a download button. Maintains button visual, even if it's the current menu item. @netweb @SergeyBiryukov Adding a menu item that points to txt-download adds a download button now. Where yould be a good place to document that behavior? Any chance of tweaking that bottom border or is that a limitation of the entire menu height? Still not easily discoverable though, what about making it a default menu entry for all sites and it to each site ? Main: Temporarily disable stylesheet caching. Largely because I anticipated fixing any issues right away and not letting them become a problem. For now, the theme also doesn't get activated until it's 100% translated. Per #1201, "Download" was supposed to be one of the default menu items, so I guess now is the time to add it to each site for consistency. If it's done automatically via a filter, I don't think it needs to be explicitly documented. The txt-download slug doesn't make much sense long term though. It's an internal slug created when the page was a part of the home page layout. Now that it's an actual page, we should change it to download. I think the text is supposed to be left-aligned with the page title, like on ​support forums. Currently it's not aligned, see 2861-alignment.png​. The theme has ​~25 strings in page-get.php that appear to be a leftover from the Plugin Directory and have nothing to do with the main site, but still need to be translated to get the project to 100%. Can we remove them from the project? Main: Remove Get page template. It was meant as a shell for a future Get WordPress landing page but is unneeded at this point in time. If the page has two columns, then yes, it would look like the Support page mentioned. On second thought, if the goal is to keep it styled as a button and display it separately from the rest of the menu items, I think it should just be a part of the header template rather than a menu item. The page it links to already exists on each site, so no additional logic should be necessary. The txt-download slug should still be changed to download though. Alternatively, the slug could remain as is, and some code could be added to map /download/ to /txt-download/. and follow-up changes would also need to be ported to wporg-themes, wporg-plugins, and wporg-support themes, as they share the same menu and currently display a regular link instead of a button. Main: Use correct color for active menu items. Main: Bring back localized showcase teaser. Also fixes line-breaking headlines in some locales. WP.org: Always look for parent's inc folder. Handles missing global header in child themes as well. Added a page template called Downloads that will, when selected, allow for a custom (translated) download URL. Main: Add a Download page template. Allows localization of the download page slug. Main: Show download buttons for pages with template. WP.org: Make 404 hinge work. Alternatively, nav_menu_objects() should be moved to a mu-plugin, as it doesn't make much sense to duplicate the code in four themes. Agreed, I have a half-finished patch on my sandbox. Should be fixed by early next week (Thanksgiving). Plugins: Updated wp.org header styles. Adds the ability to handle download buttons on Rosetta sites. Plugins: After , add missing _breakpoint.scss file. Breathe: Download button styles for Rosetta sites. Main: Remove Download button handler. Removed from the theme so it can be moved to a more central and rosetta-specific place. Rosetta: Add Download Button handler. Makes a link to the downloads page a button-style link like on wp.org. Themes: Download button styles for Rosetta sites. Support: Update wporg header styles. Removes wp4.css dependancy and accounts for download button on Rosetta sites. The download button is now being displayed across themes/plugins/support/p2 themes as well. @SergeyBiryukov @netweb I think this concludes the items that you brought up? @ocean90 What do you think about creating new tickets for enhancements past bringing the w.org homepage to Rosetta sites? Fine by me. There's already #3288 and #3289. Main: Avoid overflow breaking layout. Fixes a bug on sites with outdated sidebar data, where it wouldn't show a sidebar. Main: Introduce search archive page. Better styles for mixed-post-type search results. Also properly displays the template for empty search results now. Main: Check if $rosetta exists. Makes is easier to run the theme locally and outside of the context of a Rosetta site. Main: Use correct srcset descriptor. Main: Use correct file extension for swag image. 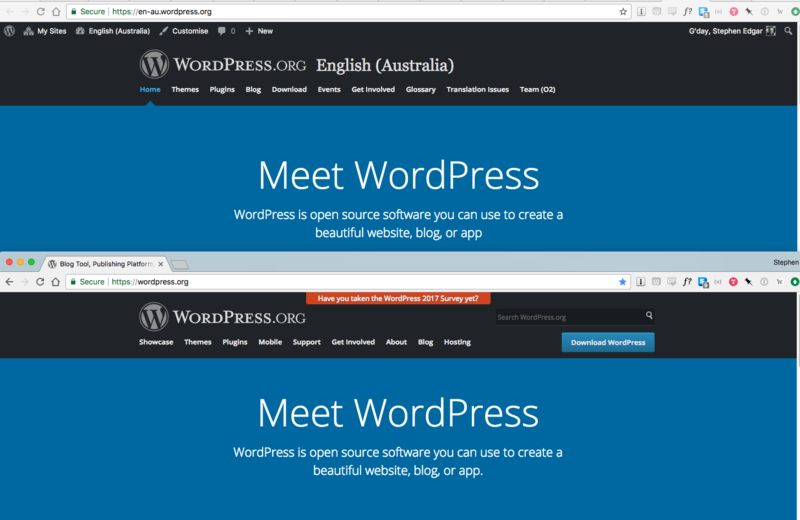 WPorg: Opt out of global header styles. Moves to using the CDN for main theme styles and only loads the dependencies it really needs. Now that we don't have that dependency anymore, we can shed those overrides as well. Makes better use of screen real estate on small screens. Theme Directory: Update style-rtl.css with styles added in .